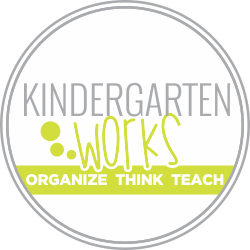 Making 5 is one of the basic and fundamental ideas that come from the Common Core standards in kindergarten. Students should be able to subitize, manipulate, create and pull apart very well in order to lay a solid foundation for further concepts. 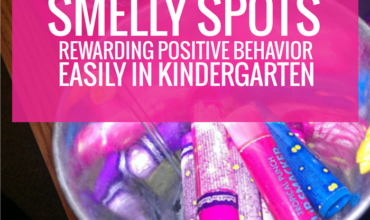 This year, I realized that I should’ve slowed down in this area for some of my students. I felt rushed to move them past it last year and in my reflecting, I know that I won’t allow the “pressure” whether it be self imposed or otherwise dictate my speed in this area next year. I now see the role making 5 plays then in students making 10, composing and decomposing teen numbers in addition to numbers to and well beyond 100. It shows me how important this skill really is. Here are some of the games I plan to play with students who need help in laying a foundation in this area. If you want them, you can get them as a package deal instant download – so there’s no waiting! Mind you, it won’t be all of my students that will need this type of work as part of a structured lesson, but all will benefit at the beginning of the year from the language, discussion and practice. 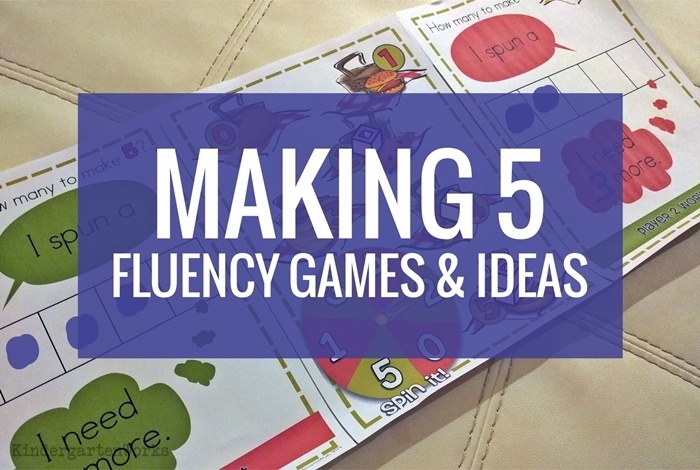 Each game works on making 5 – putting together and pulling apart and finding the missing addend essentially. There are three different game formats that all work towards this goal. The first is called, “Race to 5.” Students use playing cards to choose a number. They can use the workmats to solve to find out how many more makes 5 and then they can move a space if they are correct. First one to the picnic basket wins. I’ve included subitizing dot cards, numeral cards, equation cards and missing addend equation cards in order to help make this game last longer and to help differentiate. 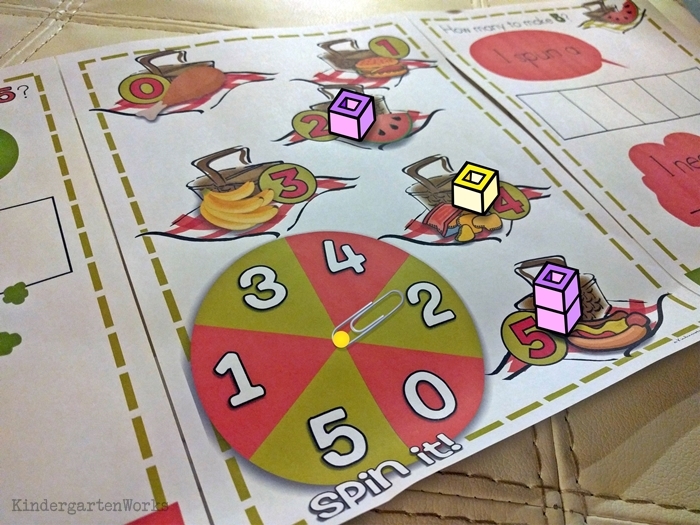 The second game, “Speed Race to 5“ uses a spinner to make it fun! Using a paperclip and a brad, you can make your own spinner which determines the number students use to build 5. Can they find out how many more are needed to make 5? If they get it correct, they can race along the board to the picnic basket. The third game, “Spin It” is a “bump” style game. 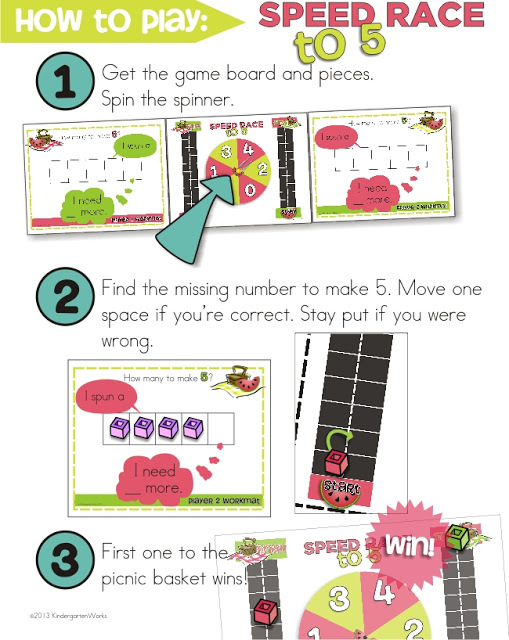 This game uses a spinner, students find the missing number to make 5 and can then cover up that number on the playing board using bump game rules of locking or bumping pieces. 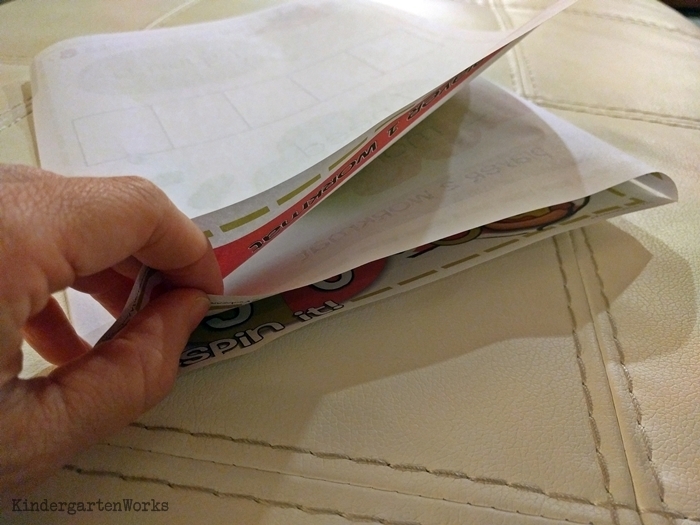 So I put together a set of directions to help you put all of the pieces together, PLUS each game has a label to help keep the contents organized and a directions sheet with picture icons for emerging readers. 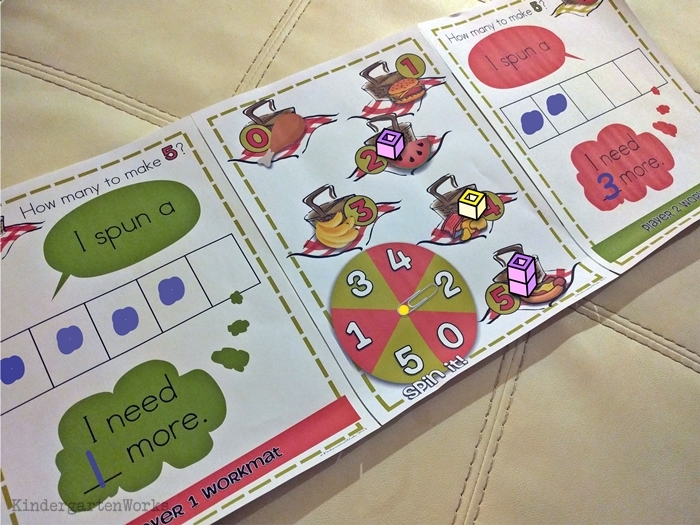 Each game includes workmats so students that can be attached to the game boards (just leave a small gap when laminating) and fold up for easy storage! 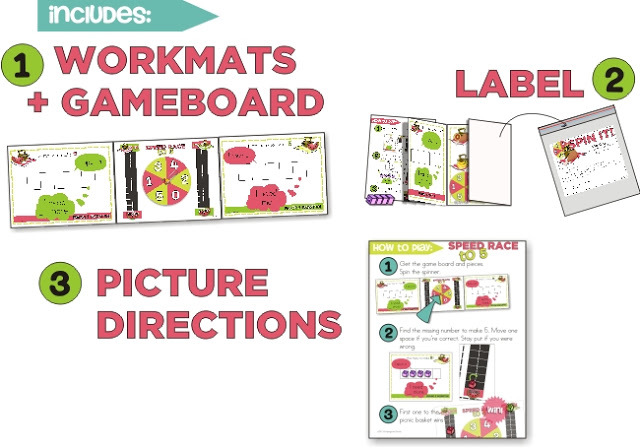 Laminate workmats with game board for easy fold up storage! 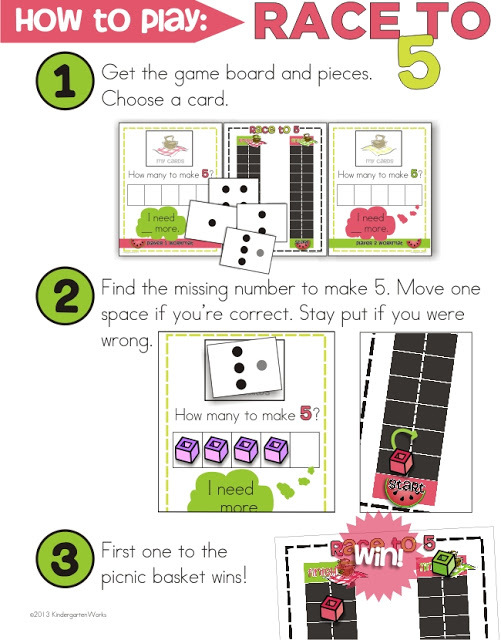 Lastly, if you haven’t already, there are great subitizing materials available as a free download with suggestions on how to work on developing strong number sense to compliment the work you do when playing games like these. I hope you like this new game set! You can get it here and print it immediately. Great games and ideas! Thank you for the inspiration. Hi! I just saw you are following my blog and hopped over to check you out. Your blog is amazing! 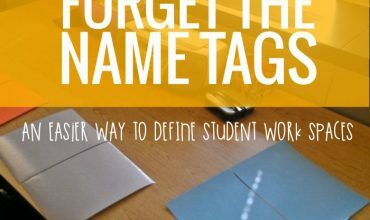 Our district worked with Nancy Norman (maybe you’ve heard of her) last year and subitizing became a familiar word to me as I had never known there were levels or even what to call what I had been practicing. Anyway, thank you for following and I look forward to reading your past and future posts!